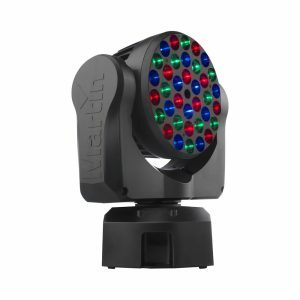 The Elation SixBar 1000™ LED Battern features twelve 12W 6-IN-1 RGBAW+UV LEDs and gives designers access to a wider range of colour combination than the standard RGB LED batterns. The SixBar is useful as a wall/cyc wash, uplight, direct view pixel strip and linear wash. The units have three variable dimmer curves and flicker free operation making them flexible enough to work in Theatrical or broadcast applications. Each unit is also equipped a diffusion filter and flare guard. Quick lock magnetic ends make for easy alignment without compromising the pixel spacing between units. Tags: cyc_wash, Elation, LED_bar, LED_battern, LED_strip, RGBAW, UV, wall_wash.